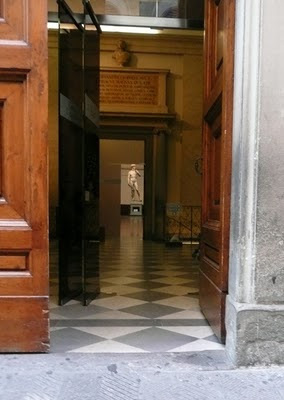 In one of my trips to Florence I lived across the street from the Academia. One morning the door was open, resulting in this shot. When you grow up knowing about something--like Michelangelo's David--it disappears on you. When you see it, you think "David" and not "beautiful" or "glorious." So you must teach yourself to see it again. I tried to see it differently by buying the refrigerator magnet and putting clothes on him. In our class it was proposed that traditionally David was 10-14 when he slew Goliath. The instructor thought he looked about 25. With clothes on he is a teenager about 16 years old. You'd worry that a 16 year old was so serious. I have a book at home--the Oxford book of Classical Art--that shows every ancient statue. The two bronze Greek men at Reggio di Calabria are very beautiful and real looking, but their attitudes are casual, like men marching through a town and flirting with the girls. I like very much the Farnese Hercules as reconstructed, but he is a man of at least 35, perhaps 40, who is well bulked up. I can think of nothing that so completely captures the perfection of youth as the David. For realism we see that he sculpts the veins on the backs of his hands. Who else does that? David was originally intended to be up on the roof of the Duomo and has a slightly big head and hands to compensate for the intended angle of view. Perhaps this contributes to the look of youthfulness in clothing. There can be no question that David captures great physical masculine beauty. It matches or exceeds other male statues. But what separates it from all others is the action. This is the moment. David is skilled in the sling from working as a shepherd and holds his weapon casually. The rock is in his right hand by his side. It compares favorably to the moment when the baseball pitcher has settled on the correct pitch. The count is 3&2 in the ninth inning. He has decided on the pitch and has just extended his left foot for the beginning of the windup. This is the moment of perfect intention, and it is this that makes David the greatest piece of sculpture ever made.